COMMANDER of the Joint Task Force set up to tackle the Apapa traffic gridlock, Rear Admiral Okon Eyo, yesterday, assured residents, motorists and other road users in the axis of his readiness to sustain the current sanity on the road in the interest of the public. Speaking to Vanguard, Eyo said: “I have been on the road for the past two days monitoring and controlling the traffic situation in Apapa. “We are in the process of carrying out a lot of changes. For carrying out the latest operation, I just felt we have to do it considering the long hardship along the area. “The reason it took this long is due to the fact that we have to weigh our options. That is why I took the advantage of President Muhammadu Buhari’s visit to Lagos in order to secure some logistics. “My intention is to sustain the current sanity in Apapa. I don’t want anybody to suffer unnecessarily any longer on that road. Also, commenting on the development, Permanent Secretary, Lagos State Ministry of Transportation, Dr. Taiwo Salaam, said: “We worked very hard to keep these trucks at Ogere, Ogun State with manual call up system in conjunction with the Nigeria Ports Authority, NPA, and other Federal Government agencies, like the Federal Road Safety Commission, FRSC. This was achieved because of the President’s visit. Before now, trucks took to major highways on Oshodi-Apapa Expressway, Funsho Williams Avenue, Lagos-Badagry Expressway, as well as well as through adjourning roads like Mba, Ajeromi and Old Ojo road, to link Apapa. 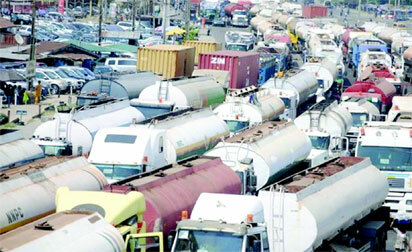 Vanguard’s investigation, however, revealed that truck drivers still park on Lagos bridges, against earlier warning by Chairman of the Joint Task Force.